If you have ever set out to grow from a small, difficult to get one seed in one spot vegetable you know how hard it can be. Clumps of plants. Bare areas. Weeds overtaking the baby plants. Frustration for the grower, when there is no real idea how many of any one variety is growing. Homer built The Speedy Seeder to make growing easier and faster. To be able to fill a planting bed full, without overcrowding. These leeks were put into this bed last fall. Sometime this summer we will be able to harvest them...it won't be quite a year, but it will be close to it. 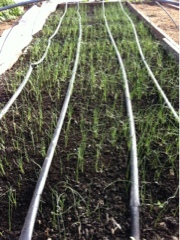 Each leek will fatten up to an inch or so in diameter. Right now each leek is about the size of a thread. Normally, we would be fussing with weeds, spacing and germination. Using The Speedy Seeder we know just how many are in the ground, and it is enough for a number of weeks worth of distribution for our vegetable CSA. There are now 2 videos that demonstrate how to use The Speedy Seeder on our Kickstarter page. Kickstarter works that only if we are fully funded to we get any funds: we must reach our goal of 800 Speedy Seeders ordered to be able to receive our funding and fill orders. Watch both videos. Order a Speedy Seeder. Forward the link to your friends. Grow leeks, carrots, lettuce, herbs, flowers from seed and enjoy the beauty with a tremendous reduction in hassle. Here's the link: http://kck.st/VBaVLV. Click on it now. And get growing.